Fiscal cliff: Why the stalled negotiations between Barack Obama and John Boehner are a sign they are making progress. Why stalemate is actually progress. If you are distracted by the holidays and not paying attention to every twist and turn of the fiscal cliff drama, the guidelines we set up several weeks ago still apply. Until House Republicans say they support a tax rate hike, you can ignore the noise and go about your life. However, if you happened to turn on C-SPAN today, you might have seen Speaker John Boehner talking about the fiscal cliff and wonder what’s going on. 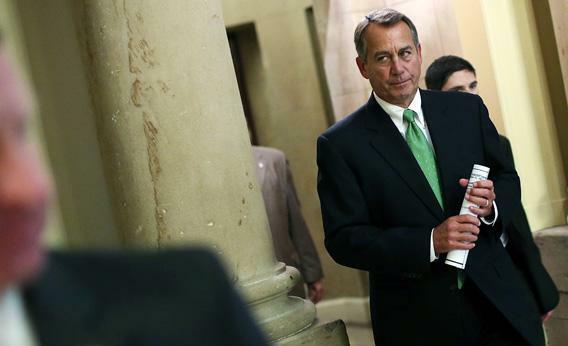 Boehner said that the president has not offered enough spending cuts in negotiations. The only way Boehner is going to get House Republicans to sign on to a tax increase is if he can show his troops that the president has agreed to significant spending cuts. That sounds like stalemate. It is. It’s also a sign of progress. At this point you might want to go back to wrapping presents. Fiscal cliff talks have this frustrating circularity to them. That’s why the Wall Street Journal can claim there is progress on the same day The Chicago Tribune can say there is a stalemate. If you continue reading, we can’t be responsible for putting you in a bad mood for your office party tonight. The final fiscal cliff deal will almost certainly contain an increase in tax rates and spending cuts large enough—or of a kind—to irritate the president’s supporters. White House advisers say that in the 2011 debt ceiling negotiations, the administration named too may spending cuts on the theory that Republicans would then agree to tax revenue—but then the GOP cuts didn’t follow. So they’re going to let Republicans go first this time. GOP sources familiar with the talks say the White House hasn’t been as forthcoming as they were during the last set of negotiations—Medicaid changes are one example. So Republicans are legitimately frustrated. That might make you think the needle is pointed toward stalemate. But if there is ever going to be a deal, it will only happen if Boehner looks like he has dragged the president somewhere President Obama doesn’t want to go. Each time the speaker makes a public display, as he did today, it shows that he is fighting the good fight and holding the president’s feet to the fire. Now, if there is a deal, he can say, “I beat on the president about cutting spending, and he gave in.” Members are going to look closely at the math above the theatrics, but if Boehner were unable to point to moments of peril and stalemate, his rank-and-file will just assume he got rolled. Therefore, this statement that seems to be about frustration—which would suggest we’re farther than ever from a deal—can actually be seen as a necessary prerequisite for a deal. Everyone is still at the negotiating table fighting about taxes and spending, which means nothing has really changed in the underlying story. By the end of the day, we learned that Boehner made his CSPAN-televised remarks after receiving a White House offer (which he didn’t mention on the House floor). The president had trimmed his proposal that $1.6 trillion be raised from taxes to $1.4 trillion. Boehner responded with his own counteroffer later in the day. Negotiations have stalled—which means they are making progress.